This is a structured 20 week fitness education program preparing runners for Berlin Marathon 2018. Training for Berlin Marathon 2018. Known for being a flat and fast race, the Berlin Marathon holds the title of most marathon world records set on its course. Racing through Brandenburg Gate and Victory Column, the BMW Berlin Marathon is one of six marathons that make up the Abbott World Marathon Majors. Experience the most beautiful city in the world with 40,000+ of your “closest” mates with participants from over 107 countries. Beginners and seasoned marathoner alike benefit from the course's flat nature and with a reputation of being the fastest marathon in the world, Berlin is the perfect race to reach that PB or run your first marathon. There is a $220 registration fee (non-refundable) to join our Berlin Marathon 2018 training program. You commit to fundraise at least $2,200 for the Can Too Foundation. As a registered Aussie charity our mission is to invest in breakthrough cancer research projects like A/Prof Phoebe Phillips. Our community is passionate about making a difference, and there's no option to train with the Can Too Foundation unless you're willing to fundraise. entry into the Blackmores Sydney Marathon ($140 - $160) including any costs getting to/from Australia to Berlin for the event. Please see our FAQ's for advice on securing an entry to the Berlin Marathon. entry into a local 'practice race'. This is usually around $50 and an optional part of your training program. Your registration does not include race entry into the Berlin Marathon 2018. Please see our FAQ's for advice on securing race entry. As a health promotion charity, we invest a lot in supporting you to achieve your goals over the 20 weeks leading into the Berlin Marathon 2018. It's how we've fundraised nearly $20 million and invested in 156 cancer research projects since being founded in 2005. You don't need to be able to run a marathon, to start training for a marathon. 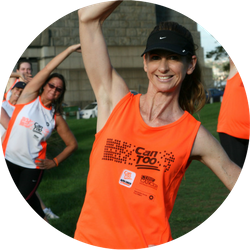 Can Too's Berlin Marathon 2018 is a structured training program that uses qualified and experienced coaches in small group environments. Our first session is an 60min run/walk (max 8km), so ideally you've completed at least one half marathon in the past. Check the run schedule as an example of marathon training. If you're at all concerned, please contact us or check out our list of alternative training programs. If we can ... You Can Too!